Mt. Sneffels is the 27th highest 14er in Colorado at 14,150 feet. It’s located in the San Juan Range of the Uncompahgre Forest, west of Ouray. The history of the mountain’s name is somewhat vague and subject to considerable difference of opinion, but includes one theory that is linked with the Jules Verne 1864 novel “Journey to the Center of the Earth”. Go figure, we’ll let you look into that, if interested. The usual starting points for climbing Sneffels are out of Yankee Boy Basin, but can also be reached, with a good bit more effort, from the Blue Lakes Trailhead to the north off CR 62. The most commonly used routes to reach the summit are (as named by 14ers.com) are Mt. Sneffels - From Yankee Boy Basin and Mt. Sneffels – Southwest Ridge. The naming convention seems curious since two routes share the same trail from Yankee Boy Basin for much of the way. This description covers both approaches. The starting point for either route depends greatly on what kind of vehicle you have. Reaching the upper trailhead (12,460 feet) REQUIRES a tough 4WD vehicle (read Jeep) with high clearance. Starting at the lower trailhead (11,350 feet), commonly called the restroom TH because of the pit toilet there, is somewhat easier to reach but still requires a very study, off-road, hardened 4WD (if you have a Suburu or similar, count on parking even lower, as we did at 11,100 feet). Try to get to at least the lower TH because the tourist shuttles turnaround below this point. What we have attempted to do here is describe both routes to the summit in one description. Hopefully this information will help the reader decide which route to attempt, but we warn you, neither is easy. The standard route is west across a boulder field, up a scree slope to a saddle, then boulder scramble to the top. 14ers.com classifies this route as difficult class 2 with class 3 exposure. Starting from the upper TH, the numbers are 2900 feet aeg and 6 miles RT. The Southwest Ridge route is from the saddle at Blue Lakes Pass, then north up a boulder laden and faint trail to the top. The numbers are 2950 feet aeg, and 6.5 miles with class 3 difficulty and class 3 exposure. The reader is advised to look closely at the tracks posted for the two routes to better understand the narrative below. 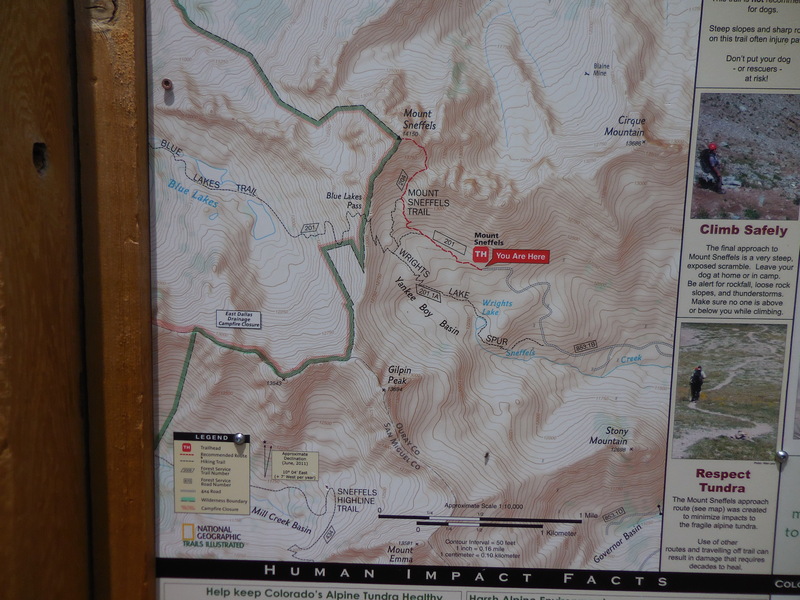 The standard route description will start from the upper TH (Yankee Boy Basin). Remember, as stated earlier the road to the upper TH is steep and aggressive. A combination of a shorter wheel base, 4WD and high clearance is strongly recommended. The standard route is pretty straight forward, or perhaps more appropriately pretty straight up. After leaving the TH, you will travel barely three-tenths of a mile to a signed junction marking the turn-off to Mt. Sneffels. The trail will take you through a talus field and a few switchbacks before the steep ascent begins. The trail ascends almost directly up the middle of a prominent gully to a saddle, or col at about 13,600 feet. The trail up is loose, badly eroded in spots, steep and not definitively recognizable among the several paths worn through the middle of the gully. Simply choose the route that best suits you and shoot for the col. From the col, make a sharp left up the boulder strewn chute. Be aware of those above and below you during this portion and watch for dislodged rocks. If snow seems to be blocking access up the chute, one can bypass the chute by scrambling high up on the left. At the top of the chute you will make another left. Next locate the small V shaped notch that guards the final few hundred feet to the summit. Pull yourself up into the notch and then follow the pretty well cairned route to the summit. Some modest scrambling is required; however, it remains a class 2 climb to the summit. Once at the summit, return the way you came, or for a little more adventure consider a return via the class 3 route. We started hiking well before the lower trailhead at about 11,100 feet. This made for a more difficult and longer day, but allowed us to take the Blue Lakes Trail through some very beautiful terrain, past Wright's Lake, and lots of flowers up to Blue Lakes Pass. After Blue Lakes Pass, the adventure begins. Looking up the ridge, it looks impossible, but as you gain elevation openings appear and you keep climbing. We got off to the left at one point (see my “up” track) and had to downclimb and go to the right. The scrambling is continuous, but the views are increasingly spectacular. There is no mystery to this climb; just keep going up and watch for the infrequent cairns. I’m not sure the track will be of great help, because one cannot scramble class 3 rock and carry a GPS in one hand. You won’t encounter a lot of people on this route, even on weekends, because of the difficulty. Once you get to the top, expect lots of other hikers reveling in their achievement, and rightfully so because either route is challenging. We went down the Standard Route. The scrambling and boulder hopping to the southeast saddle is very challenging (see above). From the saddle, the entire descent to the lower part of the boulder field is down the slipperiest slope I’ve seen in a while. This is a dangerous area and there are routes everywhere from people trying to find the best way up or down. After slip/sliding for a while, it seemed to me that it is best to stay off the scree and just boulder hop down. Kicking rocks loose is too easy, but the danger of dislodging rocks is lower among the larger boulders. You really have to watch where you are relative to people above or below you. It wouldn’t be a bad idea to wear a helmet for the entire loop and a pole may be helpful going down in the loose stuff. This route leads you to the Blue Lakes Pass connector trail, upper TH, lower TH, and to wherever you parked. 14ers.com is a great resource Mt. Sneffels. A good paper map is the National Geographic Trails Illustrated Map “Telluride, Silverton, Ouray, Lake City” #141. Storms accompanied by lightning, are nearly a daily occurrence in mountainous Colorado. Many hikers are struck by lightning each year. The rule of thumb is to be well off the peak before noon, but you should look at weather forecasts before starting out and watch the sky while on the trail. Mt. Sneffels is definitely not a dog friendly peak along either route. If you bring Fido, you’ll spend the majority of your time and a lot of energy lifting and carrying the dog up and down class 3 terrain. You might not even summit and may endanger yourself and your dog in the attempt. From Ouray, Colorado, go west on CO 351 (turns into 853, also known as Camp Bird Road) for about 4 miles into Yankee Boy Basin. About 1 mile past Camp Bird, turn right onto the narrower 853.1B. 831 continues along Imogene Creek and eventually over Imogene Pass to Telluride. Continue on 853.1B another 5-6 miles (or as far as you can go in your vehicle) to the upper Sneffels trailhead.